This site contains the full text of E. W. Hornung’s Raffles stories with extensive annotations (now including the 1903 play by Eugene Presbrey), as well as more than 200 illustrations that accompanied them in the magazines and newspapers where they originally appeared, and a map of London with locations from the stories. The notes contain spoilers which are unmarked, so if you would prefer to read them without annotations the first time, you can download the books for free at Project Gutenberg. A. J. Raffles, gentleman thief, was once a household name, and his stories once rivaled those of Sherlock Holmes in popularity — and in fact Hornung and Sir Arthur Conan Doyle were brothers-in-law. Hornung was married to Conan Doyle’s sister Constance. Although not as widely read as they once were, we think these stories deserve a wider audience and we hope to do our part to save them from obscurity. Raffles Redux is now available as an ebook in the Kindle store. 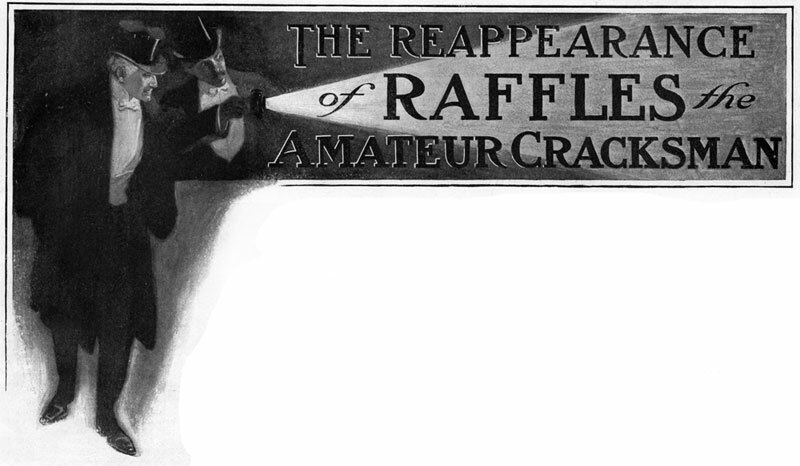 The Raffles stories are in the public domain. All other text copyright © 2014 Sarah Morrissey and Genevieve L. Morrissey. also i brought a picture, which i hoped may be a raffles illustration. I would love to see your Cuneo illustration! I’ll send you an email. However, I would like to say thank you for creating this wonderful website! The detail with which you have annotated the stories, the loving way you have collated the illustrations and the beautiful lay-out of the tales are all sublime; your efforts are beyond appreciated! For a long time I had scoured the internet in vain, finding only little references to the Cracksman here and there in reviews, Goodreads comments, notes on the TV series, and Amazon descriptions when I was purchasing the books. But, here at your site, there is at last a true monument and celebration to the stories. I’m so glad you enjoyed it! Information on Raffles and Hornung is not easy to come by and we wanted to share what we’d managed to find with other fans like you. Your kind words mean a lot! Hello! I am writing a paper for University on the topics of sexuality and gender in relation to the Raffles series. I am using the redux as a baseline for many of my points, but I fear that my professors will not take it as a source. Would you be able to provide me with links to sources for some pieces of the information? It would really be a big help. I just wanted to thank you so much for putting together all the Raffles stories on this website! I got into reading the series quite a few years ago but had to stop after reading A Thief in the Night as my library didn’t have Mr Justice Raffles. Just finished the novel and I think I enjoyed the story even more because of your annotations. Always glad to see more Raffles fans out there! Love the site! There seems to be a dearth of Raffles reprinting, made all the more odd by its public doman status. Is it all due to cringe-inducing caricatured villain of “Mr. Justice Raffles”? The stories in general may lack the iconic scenes and moments of the Holmes canon, but as a genre fiction writer, Hornung’s prose is definitely Doyle’s equal. is In any case, you should get a book deal for these annotations!